OPTIMESS RD is a robust laser scanner used for measuring the horizontal distance and the vertical difference in relation to the adjacent track. The laser scanner carries out reliable detection of the rail, and the calculations are performed and evaluated by the Data Processing Unit OPTIMESS DPU, within milliseconds. 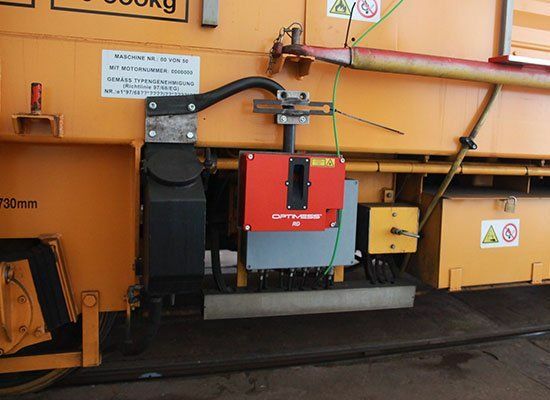 The laser scanner can be installed on the bogie itself. The large measuring range (of up to 6 metres) means it is possible to monitor the rail distance even from comparatively far away – beyond the danger zone. Even in wintery conditions, reliable measurements can be performed, thanks to both the large temperature range (-20 to 50°C) and integrated anti-condensation protection. OPTIMESS RD can be used both for laying new track and for repairing existing rail infrastructure (e.g., renewing the track bed). Custom-built control units and visual display units, and also software enhancements are also available to order. Dies ist ein Typoblindtext. An ihm kann man sehen, ob alle Buchstaben da sind und wie sie aussehen. Manchmal benutzt man Worte wie Hamburgefonts, Rafgenduks oder Handgloves, um Schriften zu testen. Manchmal Sätze, die alle Buchstaben des Alphabets enthalten – man nennt diese Sätze »Pangrams«. Sehr bekannt ist dieser: The quick brown fox jumps over the lazy old dog. Oft werden in Typoblindtexte auch fremdsprachige Satzteile eingebaut (AVAIL® and Wefox™ are testing aussi la Kerning), um die Wirkung in anderen Sprachen zu testen. In Lateinisch sieht zum Beispiel fast jede Schrift gut aus. The quick brown fox jumps over the lazy old dog. Oft werden in Typoblindtexte auch fremdsprachige Satzteile eingebaut (AVAIL® and Wefox™ are testing aussi la Kerning), um die Wirkung in anderen Sprachen zu testen.